Chingford Waste Removal provides dependable junk and waste removal services to clear unwanted clutter and rubbish from your Chingford home or business. Whatever your waste removal needs, house clearance, garden clearance, office clearance, commercial waste removal, builders waste removal or skip hire, we have the solution. We provide a fast, friendly and affordable same-day waste removal service and as licensed waste carriers you can have peace of mind from knowing that all the waste we collect is properly disposed of. You have more important things to do than spend hours traipsing to the local dump to get rid of your junk. Call today or contact us online using the easy form on the Contact Us page and we’ll take care of it for you. 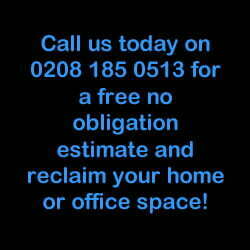 Call us at 0208 185 0513or contact us online to book your collection at the best time for you. Booking is done in two hour slots. We’ll be on our way. We call one hour before we arrive on site and we’ll give you a free no obligation estimate which includes – labour, dumping fees and transportation. There are no hidden costs when you use our waste removal service. We remove your clutter and unwanted items and we sweep up afterwards. We recently used Chingford Waste Removal's office clearance service and were delighted with the results. A highly professional and reliable company to work with - we will use them again. Great job guys, thank you. It's nice to be able to park the car in the garage now you've taken away all the junk.